In this article we will be giving an overview of accessibility settings for your individual form fields using conditions. This is an extraction of information which is provided in each form field article. Accessibility settings are three options in your advanced settings, per form field, which you choose/set to make these fields Active, Required or Read Only. By default the settings will be as displayed above. Lets run through the type of accessibility and their functions. In this example, we have two questions. The first question is titled "Would you like to receive a copy of this data?" (Yes/No) and the second is called "Email Address" (Email) so the user can specify where they'd like the data to be sent. We'd like the "Email Address" question to only be active when the previous answer is "Yes". Select the "Email Address" question and navigate to the current "Active" rule. Then, change it from "Always" to "Only When" and click "Set Rule". Since we're building the rule based on the answer to the "Would you like to receive a copy of this data?" question, we'll select it as the question when setting the conditions. Next, we'll select "Is Yes" as the answer to the question. Keep in mind, different answers will be available to select when building these conditions based on their question type. No additional conditions are required so you can click "Save" and we're all set. "Email Address" will be active only when the answer to "Would you like to receive a copy of this data?" is yes. In this example, we have three questions. The first question is titled "Would you like us to contact you?" (Yes/No), the second is "Preferred contact method" (Select), and finally the third question is "Phone No." (Phone no.) so the user can provide their phone number. We'd like the "Phone No." question to be required only when the answer to the first question is "Yes" and when the second question equals "Phone". Select the "Phone No." question and navigate to the current "Active" rule. Then, change it from "Never" to "Only When" and click "Set Rule". After, set the first condition similar to our previous "Active" rule example. "Would you like us to contact you?" will need to be equal to "Is Yes", see below. In order to add a condition, click "Add Condition". Next, select "And" because both of these conditions are mandatory for the question to be required. Users should select "Or" when only one of the conditions is required. 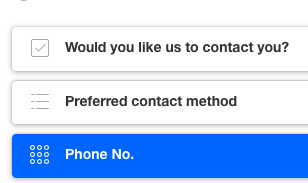 The second condition should read "Preferred contact method Equals Phone"
No additional conditions are required so you can click "Save" and we're all set. "Phone no." will be required only when the answer to "Would you like us to contact you?" is "Yes" and "Preferred contact method" equals "Phone". This concludes our overview for form field accessibility settings. If you have any questions or comments feel free to send us a message at support@devicemagic.com or leave us a comment below.